This is the CD-ROM only version of this popular title. Contains the complete contents of the book, fully searchable, with interactive table of contents and index, in Adobe's popular portable document format (PDF). 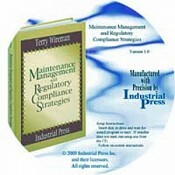 Written by a recognized expert in the industry, Maintenance Management and Regulatory Compliance Strategies is a unique reference designed to create an awareness as to how important an effective maintenance management strategy is to supporting the regulatory requirements faced by each company today. It highlights the regulatory agencies and their requirements in the context of how they impact the maintenance management function within a company. It begins with an overview of a comprehensive maintenance strategy and in subsequent chapters it examines each of the main regulatory agencies and their requirements for the maintenance function within a company. Anyone in the industry responsible for maintenance programs and those responsible for regulatory compliance issues for their companies will benefit from this guide. • Focuses on the main compliance programs—OSHA, Process Safety Management, EPA, FDA and ISO-9000. • Provides numerous examples to highlight the complexity of the standards and the integration that must occur between the standards and maintenance to insure compliance. • Details the penalties that have been assessed companies who have not maintained compliance, allowing a company to understand the impact of non-compliance with the standards. • A logical organization makes it easy to find regulatory compliance programs by: a topical outline (by regulation), an impact outline (how they affect maintenance) and a violations section that allows companies to see the cost of non-compliance.